That coincided with the catastrophic El Niño event of 1997-98, creating an opportunity for the first detailed assessment of the long-term impact a major environmental incident of this nature can have on coral assemblages. Professor Martin Attrill, Director of Plymouth University's Marine Institute, said: "Coral reefs are perhaps the most diverse marine ecosystem on Earth, potentially holding 25% of the known marine species. Yet they are under intense threat from a range of local human activities and, in particular, climate change. Any impact on the corals is going to have major knock on effects on the organisms that live on coral reefs, such as the fish, and if climatic events become more frequent, as is suggested, it is likely corals will never be able to fully recover." The 1997-98 El Niño was the most extensive global event of its kind in history, with record global high seawater temperatures in an 18-month period before and subsequently. It prompted flooding in some parts of the world and droughts in others, but also caused severe coral bleaching and mortality in parts of Central America, the Indian Ocean, Arabian Gulf, the tropical Pacific and Brazil. For this study, the research team used their own observations of eight species of scleractinian corals, and data from the Brazilian Meteorological Office, to create a full picture of environmental conditions and species behaviour that resulted. It showed a significant rise in air and seawater temperatures in 1998, with increased mortality across all species and, in one case, it disappearing completely from the reefs for more than seven years. The density of the coral in the area also fell after 1998, but then increased continuously until 2007, with recent measurements showing it is now mostly back to pre-1998 levels. Professor Attrill added: "El Niño events give us an indication of how changing climate affects ecosystems as major changes in the weather patterns within the Pacific impact the whole world. If the reefs can recover quickly, it is probable they can adapt and survive the likely changes in water temperature ahead of us. However, we found it took 13 years for the coral reef system in Brazil to recover, suggesting they may be very vulnerable to regular climate-related impacts. This has major consequences for how we consider climate change impacts on coral reefs." The study was conducted by Professor Attrill and Dr Francisco Kelmo, from Bahia's Instituto de Biologia, and their findings are published today in the PLOS ONE scientific journal. 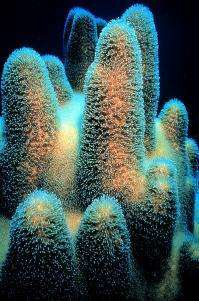 Corals love CO2, evolved in a drastically higher CO2 era, and everybody knows, especially coral experts, that they are not dying out nor in need of recovery. End these lies, Phys.org! "it is likely corals will never be able to fully recover"
Only in the small minds of enviro-heros. No need to panic. The corals will adapt to changes in their environment - just like they have for millennia. ""It's vital that the public understands that the lack of sustainability in the world's carbon emissions is causing the rapid loss of coral reefs, the world's most biodiverse marine ecosystem," said Drew Harvell, Cornell professor of ecology and evolutionary biology and head of the Coral Disease Research Team, which is part of the international Coral Reef Targeted Research (CRTR) group that wrote the new study." Must be fantastic living in your brain - just imagine what will/is happening and carry on. That will, of course, require that NikFromNYC be banned from posting here. ""It's vital that the public understands that the lack of sustainability in the world's carbon emissions is causing the rapid loss of coral reefs, the world's most biodiverse marine ecosystem," said Drew Harvell, ...."
So you're saying coral has never and will never adapt to a changing environment? What I'm saying is that as with all things on Earth, be it climate or ecosystems – it is all in delicate balance. Things alter in both those things naturally, but ( normally ) exceedingly slowly. AGW is altering things quickly ( geologically speaking ). Corals may well adapt in places and this study below indicated a particular type that seems more resilient – but it's not just increasing sea temps, it's the falling ph that they will find difficult to tolerate in the longer term. Here is what I'm saying; your a stupid man. Kind of like saying; the ducks will recover after watching an oil tanker dumps its wears on your beach front home. Kind of like the drill-baby-drill chant you had just before the BP oil spill tragedy; and then in the face of all the shrimpers that lost their lively hood from the toxic foul mess you deniers love so much. What's really stupid is to blindly throw huge amounts of money at an ill-conceived and unproven solution in order to address an unproven and potentially non-existent problem - ie AGW. If you're (NOT YOUR) going to call others stupid, at least don't reveal your (NOT YOU'RE) stupidity. Try to learn english. What is "wears"? Mr. "Turd" himself lectures others on language! (Rolls eyes...) In the English language, language names are usually capitalized. Congratulations mr nosense, you can read. Next test will be on if you can comprehend. Didn't you claim to have studied chemistry? Do you know what CO2 in water does? Are you aware what corals are made of? If you know even a smidgeon about chemistry you can put 2 and 2 together. And that something evolved to adapt to an environment (and then adapted to a change of that environment over a long time to the current state) doesn't mean it is viable NOW in its original environment.